In 2001 GlaxoSmithKline (GSK) and the University of Hull were working on ways to do chemical synthesis; both institutions found that running chemical reactions on a microfluidic scale made them behave differently compared to reactions carried out in traditional batch based containers, such as a glass flask. Syrris was founded to capitalise on these kinds of microstructured reactors and immediately forged relationships with both GSK and Hull. Syrris called this new field “Flow Chemistry”. Nothing existed in the field, apart from proof of principle rigs in the GSK Hull and other labs, until Syrris started working. Syrris starting led to an investment from GSK, the inauguration of an engineering team and the development of new concepts in 2002. Syrris quickly identified that off-the-shelf components were not suitable so they developed pumping and thermal technology components, chips and connectors; in fact everything required building a Flow Chemistry system. At the beginning of 2004 Syrris were ready to release a product but quickly discovered that the mass chemistry market weren’t ready for it, most didn’t even know what Flow Chemistry, or a microreactor, was. Syrris boldly chose to mothball the first generation product. Instead, they developed a sophisticated variant of their internal test system, which became a second-generation product called Africa launched in June 2004 in Boston, USA. At this time, most chemists could grasp the theories around Flow Chemistry but they struggled to find examples of proven chemistry to back up the new thinking. Interested companies bought a single Africa system so they could begin testing the science and see what could be achieved. Africa quickly became popular amongst large pharmaceutical organisations, but as a high-end system some people were priced out or reluctant to take the financial risk. After initial interest, sales dropped sharply. In response, Syrris came up with a cost effective introduction to Flow Chemistry kit in the form of the, third generation, FRX. The FRX was launched at the end of 2006, and soon after competitors launched rival products that used off-the-shelf components. These products had weaknesses but their low cost opened the floodgates for Chemists wanting to try Flow Chemistry. 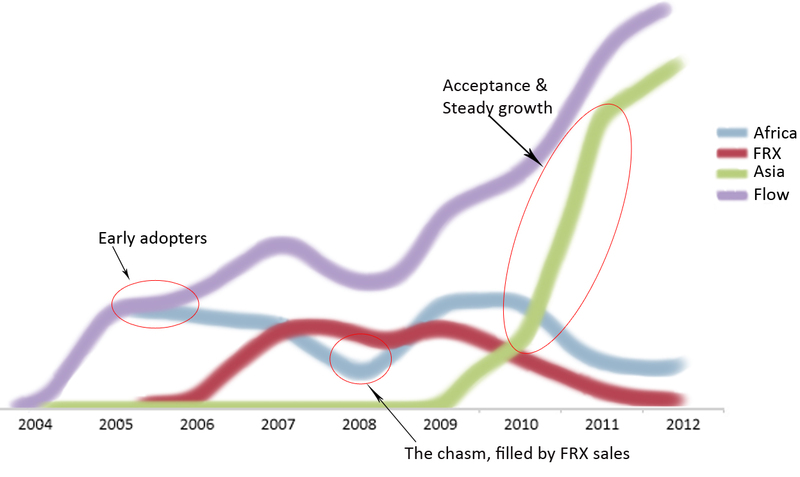 In 2009 Africa sales rose again because chemists had growing confidence in Flow Chemistry, the FRX and other low cost alternatives allowed more people to practice Flow Chemistry, and this caused a sharp increase in the number of papers being published. Flow Chemistry was a valuable tool and now there was proof. Chemists who realised this wanted to push boundaries. Recognising that they needed more advanced equipment, they sought out most advanced system on the market, the Africa system. With Africa sales on the rise, Syrris pushed ahead with development of a fourth generation product called Asia that was more robust, smaller, cheaper and offered higher performance than generations one – three. The first modular component, a pump, sold in 2010, and the complete system launched in 2011 where it sold more than three times the number expected. 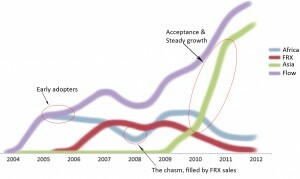 2012 saw sales in Asia grow even further. Today, Flow Chemistry is established as a significant toolset in chemistry, and has reached a maturing state of steady market growth around the world. In 2012 Syrris won the prestigious R&D 100 Award for the Asia Flow Chemistry System.